I have several single coil latching relays, (low rep points so not hyperlinking), mouser.com/ds/2/212/KEM_R7002_EC2_EE2-540906.pdf (EC2-5SNU). I am trying to control them by an MCU; connected directly they work fine, but I am iffy about keeping it this way so I'm trying to power them through a darlington pair array: ti.com/lit/ds/symlink/ulq2004a.pdf (ULN2003). As I think you understand, for this model of the relay there is only one coil and set and reset are carried out by polarity reversal. This is indicated on the schematic symbol. Figure 1. Coil polarity for set and reset operation. The problem is with the ULN2003. Figure 2. The ULN2003 inverter and a detail of one output stage. Notice that this is an open-collector transistor output stage. It can only pull low (sink) and cannot source (supply) current. Figure 3. 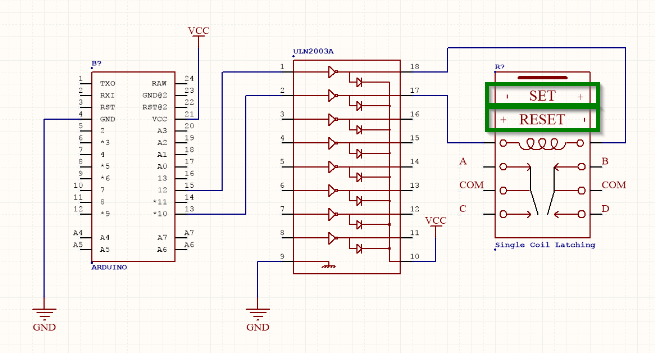 (a) What you created (in top schematic). (b) What you need - H-bridge. You need a little redesign. A simple H-bridge would do the trick. I don't know which coil voltage you are using but it may be possible to drive the relay coils directly from the micro-controller. Calculate the current required from the coil specifications on page 8 of the datasheet. Then compare this to the maximum source and sink currents of the micro-controller. Watch the chip total current too. You might be constrained to energising one coil at a time. Figure 3. Snubbing options. 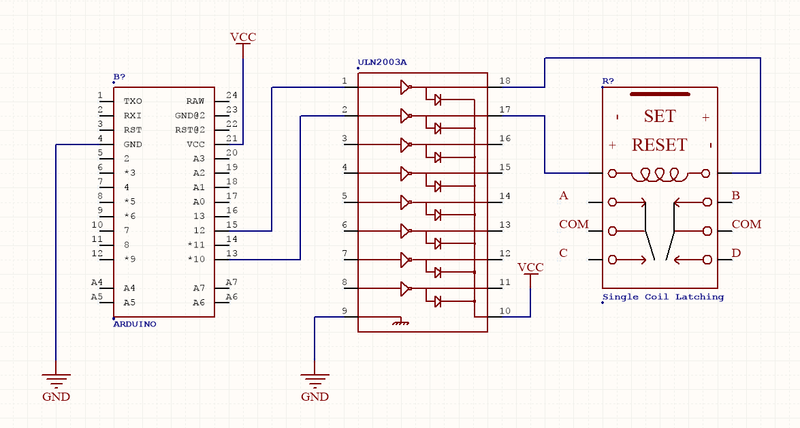 Option (b) integrates the four diodes into a bridge rectifier saving some PCB space and soldering. Not the answer you're looking for? Browse other questions tagged arduino relay uln2003 or ask your own question.